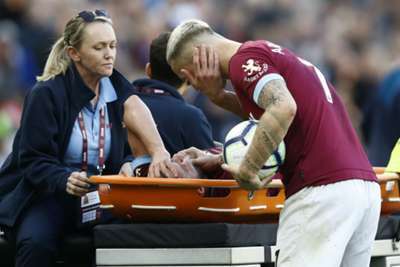 Andriy Yarmolenko was added to West Ham's lengthy injury list after sustaining an ankle problem in Saturday's defeat to Tottenham and Manuel Pellegrini acknowledged it could be a bad one. Ukraine international Yarmolenko was forced off on a stretcher at the end of the first half, with Pellegrini later confirming he hurt his ankle. The Hammers were already missing Winston Reid, Manuel Lanzini, Andy Carroll, Carlos Sanchez, Pedro Obiang and Jack Wilshere due to injuries. It remains to be seen how serious Yarmolenko's problem is, but at the time he required a stretcher to help him off the pitch and Pellegrini is not optimistic. "I prefer to wait for tomorrow [Sunday], before commenting on Yarmolenko. It is better to have the diagnosis of the doctor first to be more sure what has happened with his foot," Pellegrini told reporters. "It's his ankle, between his foot and the ankle, so it is better to wait. I don't talk about it anymore, it didn't look so good but still, we have to wait. "We have five players who have long injuries, now if we see tomorrow about Yarmolenko – it might be more. Obiang had a calf injury in the last day, but I hope it will be a short one [absence]."